Most of you are already familiar with the recent NPR story that says fidget spinners don’t help students with ADHD. The article interviews clinical psychologist and Duke University professor Scott Kollins who claims there’s no evidence that fidget spinners help people with PTSD, anxiety, or ADHD. 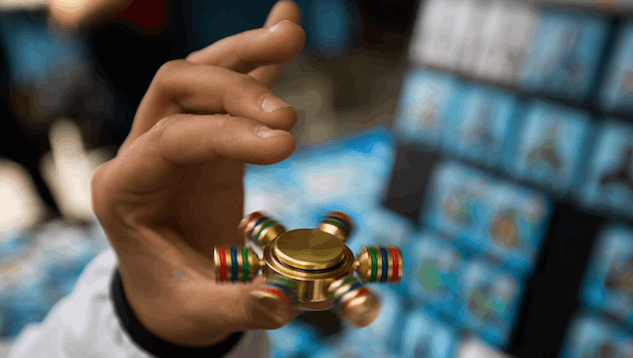 “If their description says specifically that this can help for ADHD,” he says, “they’re basically making false claims because these have not been evaluated in proper research.” The article also mentions that several teachers find fidget spinners to be huge distractions in classrooms, which is why many schools have since banned them. So fidget toys are basically homeopathy for ADHD, right? Well not exactly, says Katherine Isbister, Professor of Computational Media at University of California, Santa Cruz. In a recent article on The Conversation, she explains that fidgeting with objects is nothing new—we all have that one co-worker that clicks their pen nonstop—and that research shows fidgeting helps some people focus. Isbister points to her own research that shows “evidence of self-regulation towards achieving calm, focus, and creativity” through the use of fidgeting with objects. However, she’s quick to point out there haven’t been any studies done on fidget toys’ long-term effects. Still, there is research that shows a connection between fidgeting and attention. A research paper published in Child Neuropsychology in 2015 took a look at 44 kids between the ages of 10 and 17—26 with ADHD and 18 without—to compare leg fidgeting while doing computer work. Each participant wore an actometer on their ankle to measure activity. “Within-group,” the study reports, “children with ADHD generated higher intensity movements in their correct trials compared to their error trials, whereas the TD [typically developed] group did not demonstrate any within-group differences.” In other words, the kids with ADHD performed better when they fidgeted than the kids without ADHD. In many of the above situations, children are “seeking” extra sensory input they may otherwise not be receiving from their environment. Some refer to this as a “high threshold” to neurological input, and as such, the more input they get, the more alert an organized their minds can be. The concept of fidget toys is based on this, where children are seeking things to touch and feel, to provide the “just right” amount of sensory input, to calm their nervous system … By having a fidget toy, a child may be able to better “filter out” excess sensory information in their surroundings and their own body, which is causing distraction, and encouraging this sensory information to be focused on a toy in the hands. This is why some are worried that fidget toys have become just another fad. Miriam Gwynne recently wrote about her concerns on Autism Awareness after her 8-year-old daughter came home from school one day saying, “Mum, it’s like everyone wants to be autistic like me now!” While Gwynne is happy that fidget toys are more widely available, she also worries that if more schools ban them, other kids will try to take her daughter’s fidget toy unaware that she needs it in order get through the day. Despite giving teachers headaches, fidget toys do serve a purpose for those who need them. Also, there are fidget toys available that don’t make the annoying whirling sound spinners make, such as the Fidget Cube. Whether or not the fad will die out, at least fidget toys are opening up conversations about ADHD and autism.